The subject of this lesson is IELTS reading skills, and we thought we’d start off with just an overview. 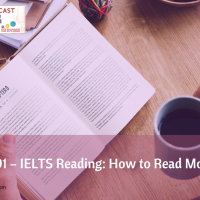 In this lesson Andrea tells us about a couple of approaches which IELTS candidates can use to read more quickly when they’re doing their reading in the actual test itself. The IELTS Test Prepcast provides three free IELTS test lessons each week for candidates who are aiming for IELTS band scores 7, 8, or 9. I’m Steve Price. I’m the founder of the Pass IELTS Higher website, which was started in late 2010 and has been successfully helping students achieve higher band scores since. Andrea Price currently lives and works in London, teaching IELTS, and has previously lived in Spain. She is a qualified teacher of English as a second language and has been teaching the subject at home and abroad for over twenty years. If you enjoy this free IELTS Test Prepcast, please show us your support and appreciation by heading over to ieltstestPrepcast.com and clicking the “subscribe on iTunes” button at the top of the page. This will shoot you over to iTunes, where you can leave a rating and review. And now for today’s IELTS lesson . . .
Steve: Okay, so the subject of today’s lesson is IELTS reading skills, and what we thought we’d do is we’d start off with just an overview. 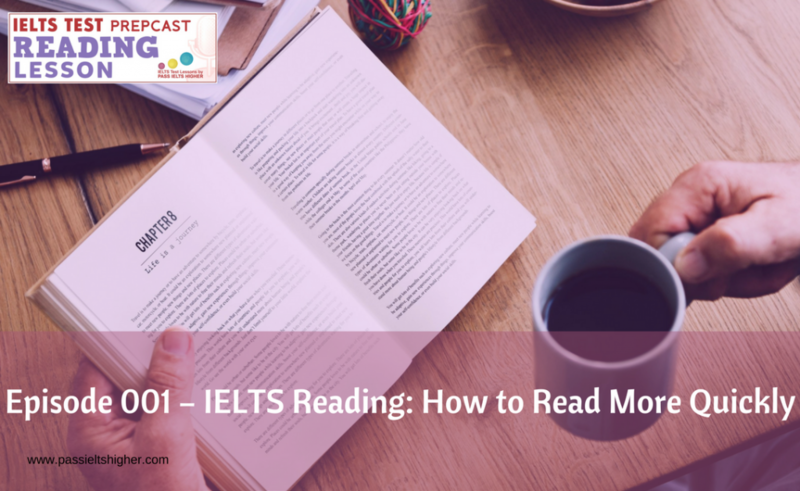 I’ve got with me Andrea, and she’s going to tell us of a couple of approaches which IELTS candidates can use when they’re doing their reading in the actual test itself. Andrea: An IELTS student always, always asks me when I’m teaching, “How can I begin to read more quickly? You don’t have much time in the exam. What can we do to read more quickly?” An educated native speaker can read three hundred words in a minute, so you need to try to replicate that if you’re a student, and obviously, it’s not so easy for you if you’re not a native speaker. You can use either of the following techniques, which I’m calling approach 1 and approach 2, and inside this approach, there are also more techniques you could put into practice. Being able to do all this will help you read and understand an IELTS text much more quickly. If I call the first approach “approach 1,” and not really technical names, it’s just the way I’m going to teach it. So this reading approach requires you to read chosen parts of the text and, inside that text, chosen parts of each paragraph. When you choose an article to read in the newspaper, what do you do to help you decide which article to read, Steve? Steve: Well, if it was me, I can go and look initially at the headline, the heading to the piece of writing, to see if I was interested in that. I would then look at an image if there was one there, the picture, to see if I found anything interesting in that or any clues in there to tell me what the article’s about. I suppose what I would probably do towards the end would be to look at the subheadings throughout the whole piece to see if I could identify what the article was going to tell me. Andrea: Yes. No, that’s exactly right, very good. So that’s what you would do, and your brain is really clever. All the time, it’s predicting things, and you’ll be able to predict vocabulary that’s coming, maybe content from looking at the headings, a picture, the subheadings. A very good writer then, in his introduction, puts his main idea, which is called a thesis statement. He will then develop this thesis statement into lots of opinions. Each opinion is voiced in a new paragraph. He then will review everything he said in the conclusion. Steve: Okay, so if I was just to, just to think of that from an IELTS candidate point of view, so what you’re suggesting is that the first thing that the candidate needs to do is to review—to read and understand, if you like—the opening paragraph, because in that paragraph, it tells you what the whole article is going to be about. Steve: And perhaps the next part of what they should do is to look at the conclusion and see if there’s any more information in that conclusion. Andrea: Yes. No, I agree with you. On top of that, there’s another thing that you can do. A good writer will put the main ideas of his thesis statement into what’s called a topic sentence in each paragraph, and so it is then possible to read the introduction, the topic sentences, and the conclusion and understand the text. Because you’re only reading the topic sentences, you’re saving the time that you need so that you’ve got more time to answer the questions. Steve: Okay. That’s good advice. Can I just ask a question about what you just taught us? From an IELTS candidate point of view, is it fair to assume that the writing that they will be faced with in the IELTS test will be written in that way? So is it fair to assume that the introduction paragraph will include all the information they need and the conclusion and the topic sentences as you just described. Andrea: Yes. No, that’s a really good question. Obviously, there are people all over the world who are chosen to choose these texts. They know what the questions are going to be, and they know the way that the reading skills are taught. So yes, I agree that they will choose texts that are written in this way. Steve: Okay, so if I was to just conclude the general overview of what you just taught us, the first thing to look at is the heading. The next, to get clues about what the article’s about, the next thing to do is to look at pictures, if there are any, to see if you can draw any information from that. After that, we can look at the subheadings, because, if there are any, and after that we can look at the introduction paragraph and the conclusion paragraph and see what we can learn from those. And within the body of the text, within each new paragraph, there’ll be what you were calling a topic sentence, typically, the first sentence or the last sentence, and that will give us pretty much everything that we need to understand, although not necessarily all of it, if I understood you correctly. Andrea: Yes. 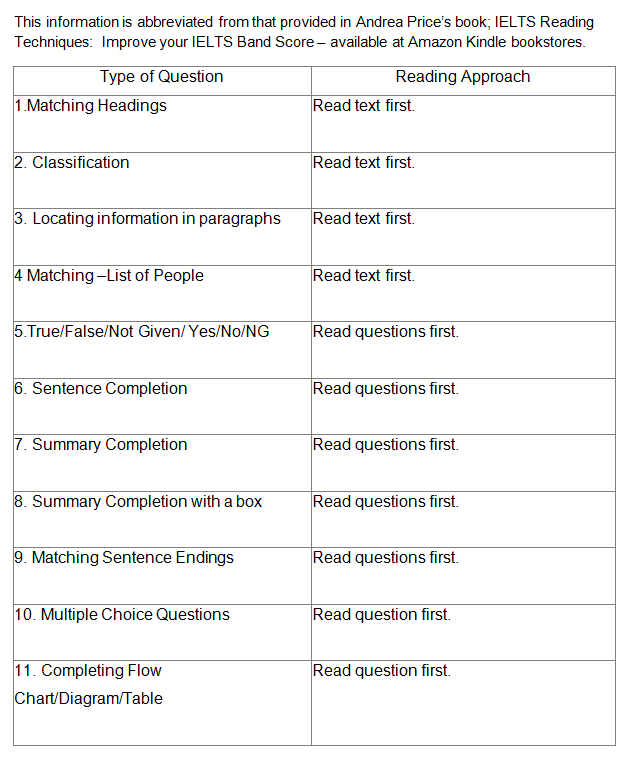 What can happen is that the main ideas will be expressed in topic sentences at the beginning of the paragraph or maybe at the end, but when you come to answer some of the questions, you’ll realize that the questions don’t, aren’t always found in the topic sentences, which is why later we will come to what I call “reading approach 2.” But this, what we’re just discussing now, will help you with some of the questions which we will also discuss. Okay, I would say, when you’re practicing reading—because, of course, you’re going to practice before you go into the exam, or else you’re not going to improve your speed—yes, you would look at the headings. And maybe you would look at the pictures if you were trying to decide what to read in the newspaper, but actually, in the exam, you probably haven’t got time to look at the headings, so you would just go straight to the introduction. Then the introduction gives you the main idea, and then from, and in the introduction is the thesis statement, and then there are more detailed discussions in the following paragraphs. Yes, ideas are again reviewed in the conclusion. Inside what is being called approach 1, you also need to have skills called skimming and scanning. Steve: Okay, you mentioned skimming and you mentioned scanning. I’m familiar with the terms, but I’m not really sure I understand what the difference is between skimming and scanning. Would you mind just explaining a bit more about each for us, please. Andrea: No, of course not. Skimming is when you need to read the text in general, very quickly, to understand in general what the text is about. You do it paragraph by paragraph. Otherwise, you won’t remember everything. And you could try to train yourself either to underline the key words so that you can look back quickly and understand the general idea of each paragraph, or you could write little notes at the side. But I think, in the exam, you wouldn’t really have time to write little notes, so it’s best to train yourself to underline what they call the key words. You need to practice key words, really, I think, to understand what they mean, and one way to skim is just to read the topic sentence. The idea of the topic sentence is the main idea, and each paragraph then has supporting ideas. Obviously, because they’re supporting ideas, they’re extra information, and you don’t need those, and then you’re obviously saving yourself quite a lot of time because you’re not reading at least a third or two-thirds of the text if you only look at the topic sentence. Steve: Okay. You hit on something there. You wanted to—sorry, you were suggesting that the reader needs to pull out the key words. How do they know what those key words are even likely to be? Andrea: Right. The reason why I’m talking about two approaches is that there are, in my opinion, two ways to do the reading for the IELTS exam. One way is to read the questions first, and then what you would do is read question 1 and look for key words in the question. These are normally the nouns or the most important idea in the question, so obviously, it’s not going to be things like “the” and “a” and maybe not the adjectives. Usually the nouns, maybe the verbs. And then having done that, you will then look at your text and look very quickly, paragraph by paragraph, the words which mean something similar. So that’s what you’re looking for, really, paraphrases. Steve: Okay, so you’re looking for synonymous phrases. Steve: Of whatever the questions ask you for, and so when you’re skimming, when you’re in your head, if you like, précising the paragraph that you’re reading, you’re précising it with, from a viewpoint of the question that you’re being asked to answer and whether or not either those words or synonymous expressions or synonymous words for those words are in the paragraph itself. Andrea: Yes. No, that’s exactly right. So we’re talking about the two basic approaches, which is looking at the topic sentences or looking at each paragraph and summarizing it in your head by underlining key words. The reason for this is that there are twelve, I would say, basic types of question, and for some of the questions, you need, you can read the question first and then you save yourself lots of time. But for some of the questions, you have to read the text first, and then for that reason, you’ve got to be able to summarize each paragraph very quickly. Although the skills are basically the same, you’ve got to skim for the key words. Steve: Okay. We’ll come on to scanning in a minute, but I think this point of about whether or not the candidate should read the questions first or read the text first is quite important. And I know that opinion’s divided. Some people believe that you should be, the candidates ought to be reading the text first so we get an understanding of the text, then they read the questions, and their mind is overlaying what they’ve just read with the questions that are being asked. You’ve mentioned that there are different types of questions, some of which would require you to read the text first and some of which would require you to understand the question first. For IELTS candidates, they—and you’ve already mentioned that they generally cannot read as fast as a native speaker. Steve: So for IELTS candidates, what they want to know in the very, very short time they’ve got to answer the question is, which is the optimum solution? Which one is generally going to work? Andrea: I would say there isn’t only one approach, actually. So there is a table prepared, which you can also get hold of, and that would tell you that for, I think, about eight of the questions, you can start with the question first, and then for the other four types of questions, you must read the passage first. Steve: Okay. So, the table that you’ve just mentioned, what we can do is put that in the show notes and on the website, and the listeners can go off and get that. Steve: Okay. Now we also mentioned scanning, and I’m sorry, I have to go down a bit of a different route. So scanning. What is scanning? Andrea: Right. Skimming is when you need to understand the text in general. You don’t read everything. You just pull out the basic ideas. You’ll have to be able to summarize each paragraph in your head, usually by underlining the key words. Scanning is quite a different skill, and you can do this very quickly. For scanning, you need to look for details very quickly. The typical details are things like verbs, nouns, names of people, names of streets, maybe names of cities, and various kinds of numbers. And then having found these, because these are really easy to find, you’re just looking very quickly for a name, for a number. Having found those, you know that the answer to your question will be there. Steve: Okay. Would that include synonymous expressions as well? Andrea: Yes, exactly that, yes. I’m glad you brought that up because the best improvement you can make is having a huge variety of key words and synonyms. The more you know, the better your IELTS band score will be, because everything really depends on those. Steve: Okay, so in terms of good performance in IELTS reading, almost—including these techniques—but almost the best thing that IELTS candidates can do is to focus on expanding their vocabulary and ensuring that they understand synonyms and antonyms for each of the words that they learn. Andrea: Yes. No, exactly that. It doesn’t need to be as wide as you said. I think what they could also do is focus on test books like Cambridge practice test books, because obviously, that’s what you’re looking for, key words and synonyms. If you practice lots of those tests and remember the key words and synonyms and every key word and synonym you learn, maybe in your class or on your course, you will just automatically get quite a wide variety of them. The IELTS tests are resold as Cambridge practice books, so they quite often repeat the topics, maybe the key words and synonyms, so the more you practice with those sorts of books, the better your—or the bigger your treasure of these key words and synonyms will be. Steve: Okay, thank you for that. I think it may just be worth summarizing everything we’ve just spoken about for this first IELTS reading skills overview lesson. Andrea: Okay. Shall I do that? Andrea: Yes, okay. Right. I think that there are basically two kinds of approaches for reading to enable the IELTS candidate to read more quickly. I’m going to call them approach 1 and approach 2. I’m not saying that either of them is correct. You have to try them and see which suits you best. So approach 1 would be to read the text, and what you should do is read the introduction, the conclusion to get a basic idea. Read a paragraph and the first or last sentence of each paragraph to get the basic idea of that paragraph. Some of the questions will allow you to—some of the questions can be answered very quickly by just looking at topic sentence, but you will soon find that not all the questions allow you to do this. The second approach really is looking at the questions first rather than the text first. And what you do here is you look for the key words in the questions, and you do it question by question. Look for the key words in the paragraph, and find your answers paragraph by paragraph. When you’re doing this, inside that, there are two more techniques called skimming and scanning. “Skimming” means understand in general, without reading everything, and “scanning” means you’re looking for specific details. Those details are things like names, numbers, and nouns and verbs and things. Steve: Okay. Well, thank you for that. Everything we’ve referenced is going to be in the show notes. We’re going have links to summary sheets of everything we’ve been speaking about, including the additional summary sheet that you spoke—the summary table that you spoke about earlier. And I think, for today, that’s the end of what we were trying to achieve. Thank you. Andrea: Thank you as well. You’ve been listening to the IELTS Test Prepcast, which provides free IELTS lessons for candidates aiming for IELTS band scores 7, 8, or 9. Subscribe to this Prepcast in iTunes, or download it from our website, www.ieltstestprepcast.com. Wow, its really useful tips for improving the reading skill.. Thank you for your interest and comment Rajinder. Please let me know how you get on when you take your IELTS exam. Very useful atical,can you provide the useful vocabulary for reading synonyms and antonyms.